A Marriage in High Life and Evelina. Baudry’s European Library, 1836 and 1838. Bury, Lady Charlotte. “Marriage in High Life.” Marriage in High Life and Evelina, Baudry’s European Library, 1836, 1-226. Burney, Miss. “Evelina.” Marriage in High Life and Evelina, Baudry’s European Library, 1838, 1-336. 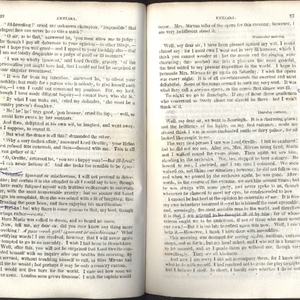 Baudry's European Library, Paris, “Marginalia by reader on page 22-23 of Evelina by Miss Burney within a book containing A Marriage in High Life, by Lady Charlotte Bury, and Evelina, by Miss Burney,” UVic Libraries Omeka Classic, accessed April 21, 2019, http://omeka.library.uvic.ca/items/show/1497.